The 'Images Of War' books are exactly that. These are mostly rare photos of the LSSAH at war, and sometimes at peace. These are just photos of normal soldiers and lower ranked commanders. There are no press shots of Peiper or Dietrich. The author does a good job of giving you a condensed history of the division. He also does not shy away from the LSSAH's many war crimes. That is one of the problems with studying or reading and writing about the German forces in World War II. How do you give them credit for their splendid war records, while still remembering at times it was they who were the subhuman monsters. This is one of the striking differences when I look at this book. You will see soldiers at war, and sometimes even see groups of them as friends laughing at an unheard joke. The pictures don't show us werewolves or vampires or other monsters, but in reality these men slaughtered men, women, and children. I am not talking about killing POWs here. Many good soldiers on both sides of conflicts have done this, usually in the heat of battle. These men fought and died like lions, yet still they committed unheard of atrocities. Each chapter starts with a written piece on the background history of the year or campaign that the pictures shown took place. As is usual with the 'Images of War' books, the photographs are mostly newly found unpublished ones from the war. 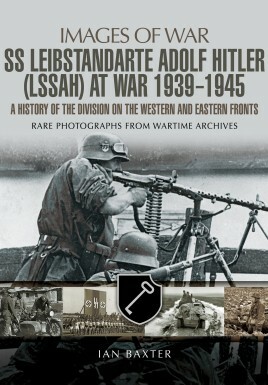 For model makers and others, the book is a great source on uniforms, weapons, and markings of the LSSAH. As you can see, their insignia was a skeleton key, but it was also a play on words. Their first commander was Sepp Dietrich, and Dietrich in German means skeleton key.